Our Golf Tournament is a fun filled day at the range with friends and family with a chance to win some great prizes! A portion of the proceeds from the tournament will benefit our Scholarship Fund. 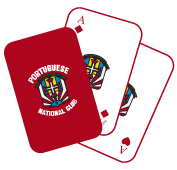 Sueca is a Portuguese card game that’s fun and challenging. The tournament starts in September and can last many weeks depending on the number of teams playing.